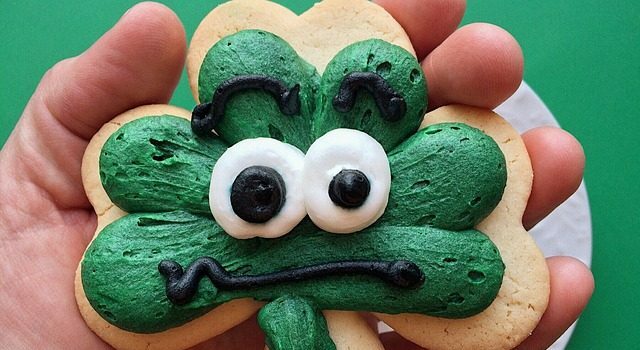 Sure, you could go the traditional Corned Beef and Soda Bread route, but if you’re looking to serve something the whole family can enjoy, how about trying a few of these fun, St. Patrick’s Day snacks? Just click the link in each title to see the full recipes! Easy to make, semi-healthy and green! All you need are grapes, a lemon and a couple of packs of Jell-O mix. The avocado food trend is still going strong, with this healthy fat appearing on everything from breakfast sandwiches to burgers. Now you follow this simple recipe to make traditional party favorite, deviled eggs with a fun, green twist! 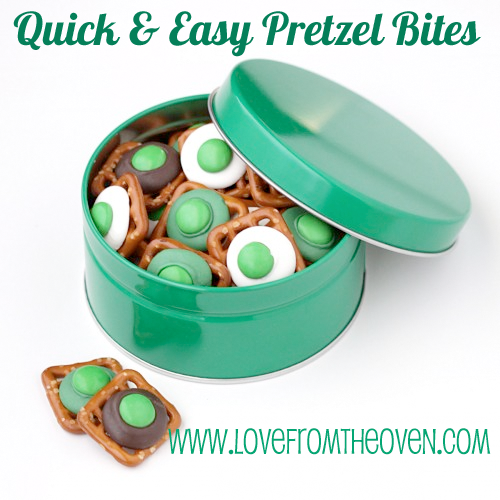 These little treats are a bit more labor-intensive, but oh so cute and delicious! The lovely mint green color and flavor are the perfect touch for St. Paddy’s Day! 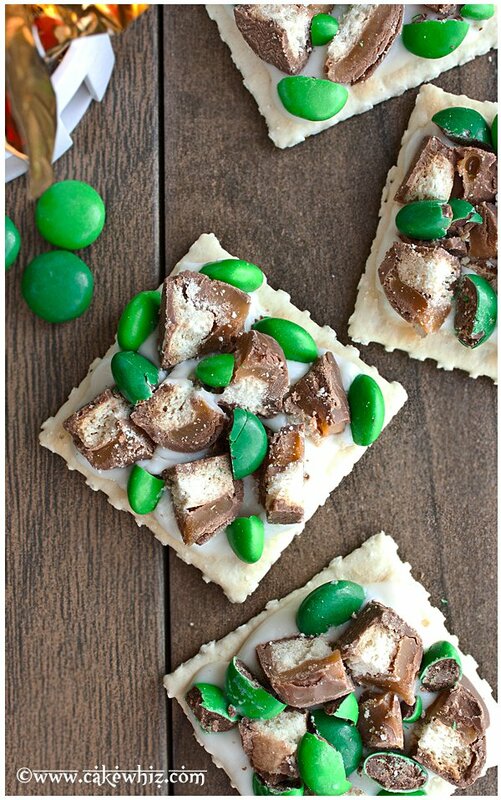 Saltine crackers, melted white chocolate, green M & M’s and crumbled Twix candy bars – this snack is fun, festive and delicious enough to delight kids and adults alike! My personal favorite! I could eat about a hundred of these before my guests ever even knew what they were missing! All you need are frozen puff pastry sheets and a very simple spinach dip recipe to achieve this warm, delicious appetizer. An easy to make, kid favorite! Just spread some snack size pretzels on a cookie sheet, lay a Hershey’s Kiss on top of each and let them bake in the oven for a couple of minutes. Put a green M&M on top of each piece of warm, softened chocolate and you’re done. 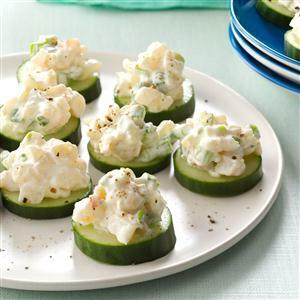 A cool, refreshing, slightly spicy shrimp salad atop a fresh green cucumber slice – yum! This delicious recipe is sure to delight the kids and you can serve it at breakfast or as dessert. 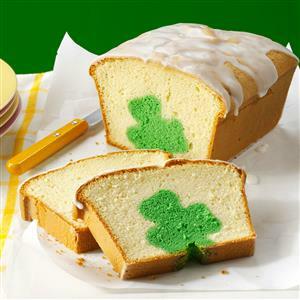 From the outside it looks like a traditional pound cake, but once you slice it, the secret shamrock surprise is revealed!